To place your order online, click here or click the Gift Set image, below. Once there, browse all the Seacret's item you love... and the Mother's Day Gift Sets tab. For offline orders, print the order form below. To earn yourself significant income from those you refer, simply overwrite my info with yours (on the order forms you send to either Seacret or to us at: seacret(at)GetUNstuckNOW.org. Questions, ideas ... like to host a Seacret WOW Spa party at your place? : use the handy form at the bottom of this page or call +1 905.764.8525. 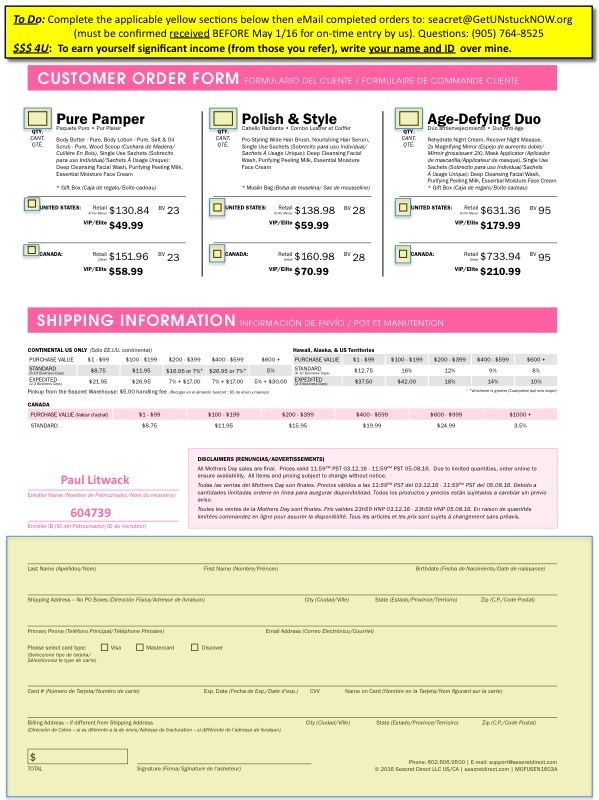 Print and return this form, completed to seacret(at)GetUNstuckNOW.org before May 1/16. Or, for online ordering, click the top image on this screen. Questions, ideas ... like to host a Seacret WOW Spa party at your place? : use this handy form, or call +1 905.764.8525.